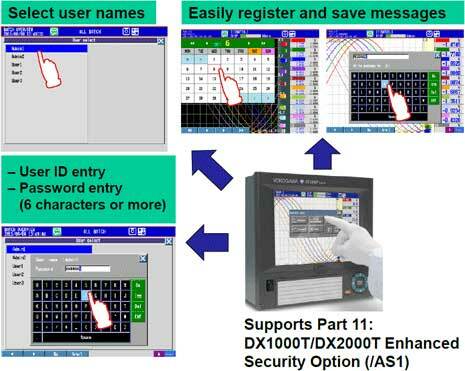 The DXAdvanced R4 optional enhanced security function (/AS1) supports the FDA's 21 CFR Part 11. With the Login function, you can manage user access and automatically record the history of the logged-in user's settings changes and operations along with measured data. On the touch screen model, user login, message entry, and other functions can be easily performed on the touch screen. The Multibatch function (/BT2) enables you to independently record data from multiple facilities (batches) on a single recorder. Recording of each facility can be started and stopped individually by batch group, and the data can be saved to separate files. With the touch screen model, you can easily assign batch groups and quickly get started recording individual data.